We took a huge chunk out of taping the bar ceiling today. 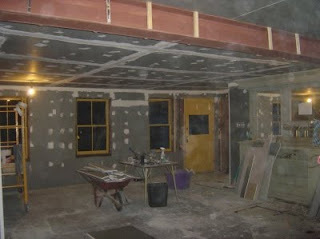 Aside from that we got more drywall in, and, apart from a thin stripe, the ceiling is all covered. We should be able to finish up all drywaling by tomorrow, hopefully, and cover the steel beam with wood (fingers crossed).